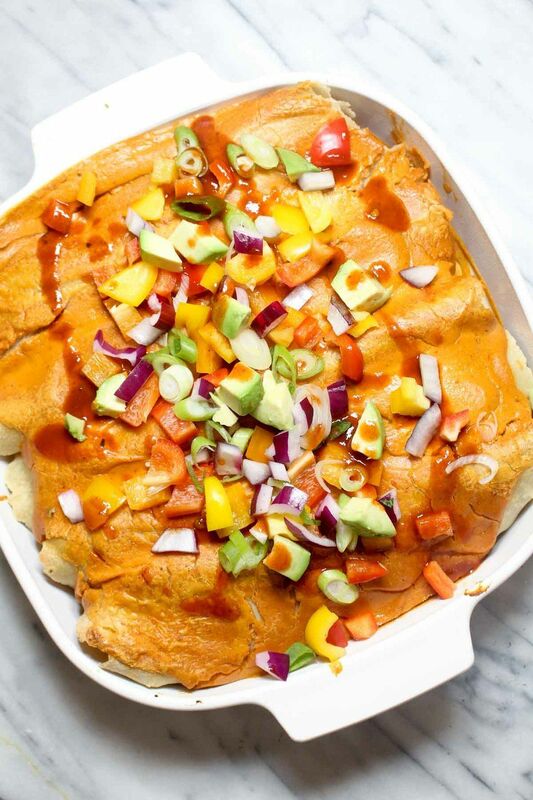 These Butternut Squash Vegan Enchiladas are smothered in a creamy, slightly spicy, and smokey Chipotle Cashew Cream Sauce. They are secretly healthy! Drain and rinse the soaked cashews and add them into a high speed blender. Add all the remaining Chipotle Cashew Cream ingredients and blend until smooth. Set aside. Add the squash and 1/2 cup water into a skillet. Cover and cook over medium heat until the squash is tender. Drain off any excess water and return the skillet to the heat. Add in the chili powder, cumin, tomato paste and salt. Sautee, stirring constantly, until the spices are fragrant, about 1-2 minutes. Add in the kale, pinto beans, and 1/2 cup of the chipotle cream sauce and cook until warmed through. Set aside. Spread a layer of the Chipotle Cream Sauce on the bottom of the baking dish. Fill each of the tortillas with 1/5 of the filling and roll. Place the rolled enchiladas into the baking dish. Top with the remaining Chipotle Cashew Cream. Bake for 30 minutes.